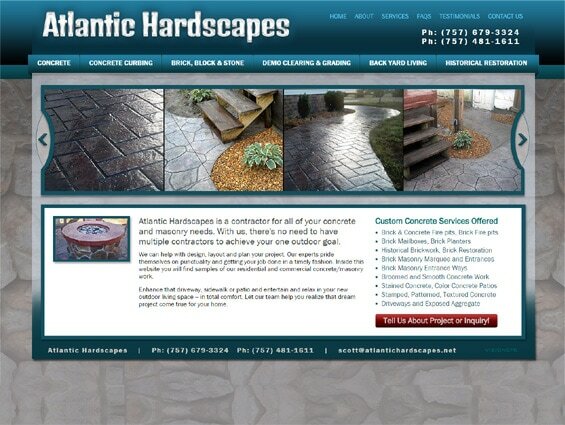 Web Design firms Virginia Beach | Atlantic Hardscapes asked Virginia web design company VISIONEFX to design a website that reflected the broad scope of services they provided for hardscape, stone and concrete projects. Using custom textures and rich web safe colors, VISIONEFX created a website that captured users the moment the home loads. Atlantic Hardscapes is a full-service company providing you with services from design and layout to build and finish-work. Atlantic Hardscapes is located in Virginia Beach, VA. VISIONEFX provides web design in Virginia to small business and organizations throughout the mid-Atlantic region. When searching Website Design firms Virginia Beach look no further than VISIONEFX for all of your website needs.